PCTPA assists public transit operators in updating their short-range transit plans every seven years to reflect changes in population, to respond to gaps in the transportation system, to evaluate their existing services, and to analyze possible new ways to provide service that may be more cost effective. Less frequently, a longer range transit planning effort takes place through the Transit Master Plan process, last completed in 2007. Upon acceptance of the SRTPs by the Board, the next step will be for each individual the transit operators to take their SRTP to their respective governing bodies for further review and final approval. It should be noted that minor changes and/or corrections may be made to the SRTPs because of this approval process. For the public meeting flyer, click here. Haga clic aquí para el folleto de la reunión pública en Español. Past SRTPs and transit studies are listed at the bottom of this webpage. In January 2018, the project team held a two-week online virtual community workshop with the objective of informing community members of the planning process and obtaining input on current and future transit needs.To review the Virtual Community Workshop Compilation of Feedback, click here. Watch prior presentations given to the PCTPA Board of Directors at their May 23, 2018 and April 11, 2018 meetings, view the recorded presentations on our YouTube channel. As the Regional Transportation Planning Agency for Placer County, PCTPA administers Transportation Development Act (TDA) funds and related programs, which help to operate local public transit services among other things. Under the TDA, PCTPA is also responsible for carrying out the annual Unmet Transit Needs process, fiscal audits, performance audits, transit planning, and transit coordination. An unmet transit need is an expressed or identified need, which is not currently being met through the existing system of public transportation. Each year, the PCTPA works with local transit providers and the public to identify these needs, determine which needs are reasonable to meet, and ensure the funds are expended appropriately. Visit our Unmet Transit Needs page to read more about the process. Sign-up here to receive future emails on our Planning for Transit efforts. 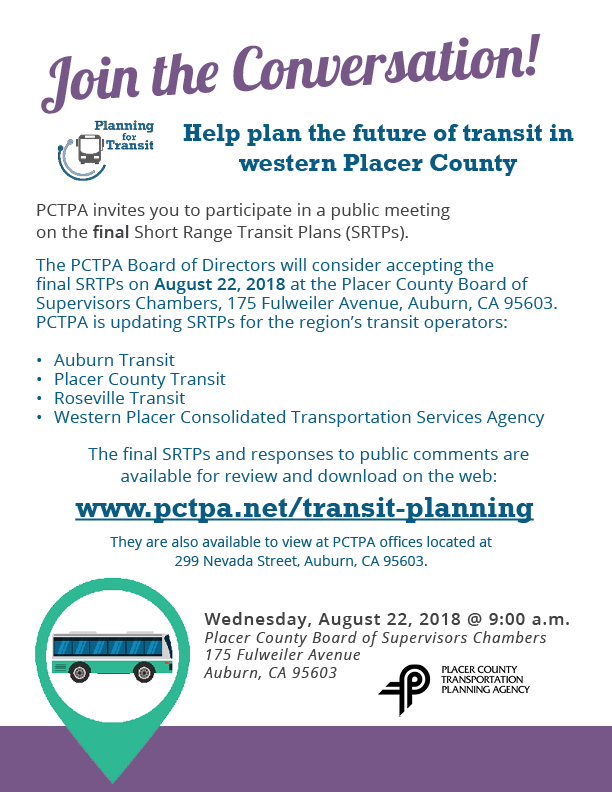 PCTPA also facilitates the Transit Operator’s Working Group (TOWG), in an effort to coordinate the various public transit services in Placer County. 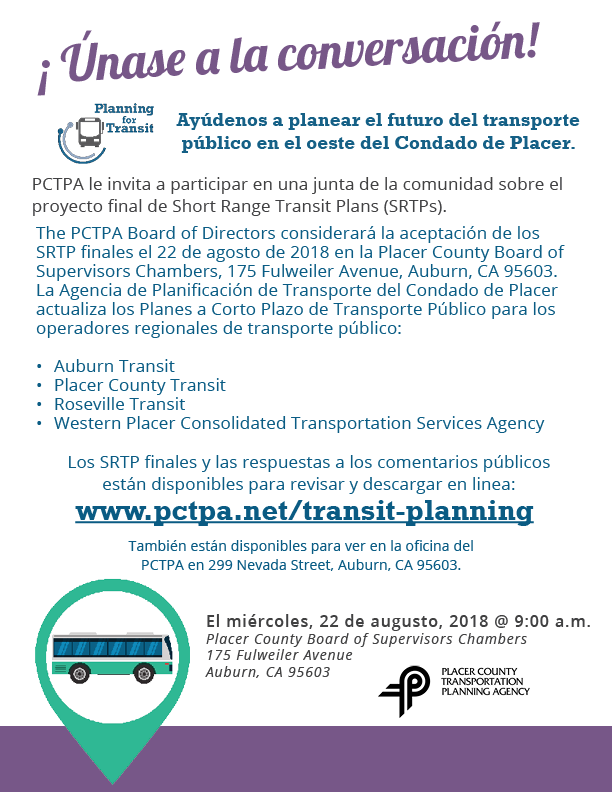 This forum is used to organize many of the efforts mentioned above, but is also used to create and manage such efforts as the Transit Ambassador Program, the coordinated transit marketing component of the Congestion Management Program, and the South Placer Transportation Call Center. For information about transit services in Placer County and links to transit service providers, see Public Transit Information.